Activities Directors in assisted living and memory care environments are busy. They have a lot of balls in the air, not the least of which is some type of movement-based programming for their residents. Unfortunately, that specific element of their enrichment programming often takes a back seat to other priorities. In a previous blog, I offered questions for leadership in assisted living and memory care environments to help them give new attention to what fitness options might be missing for their residents in other areas of the community. As we carry those questions forward and consider how to provide more comprehensive exercise classes and services, it’s easy halt progress because you’re overwhelmed by limits. After all, resources, like staffing, are often in short supply; and when you don’t have the people to pull off an excellent program, it becomes daunting to even consider a change. But don't let those concerns stop you from doing better for your residents. You may have the resources you need and the focus is really on re-imagining how to best serve the residents. Passionate & Creative Activities Professionals: Activities staff are typically responsible for providing daily exercise classes, and because activities teams often have a lot of energy and creativity, we have found success with Train-the-Trainer programs where the NIFS fitness staff on campus provide tools and resources to activities personnel to create more variety and tailored exercise offerings to residents. Qualified Fitness Staff: Many Life Plan communities have group fitness instructors, personal trainers, or exercise physiologists supporting the health and fitness program for independent living (IL) residents on campus but they are limited in reach residents who live in other levels of care. 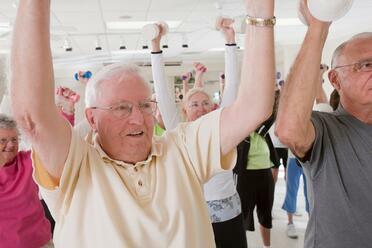 IL is where many residents begin to adopt a physically active lifestyle. With proper planning, clear expectations, and strong communication, the existing fitness staff can bridge programming and resources so that they span the campus. Supportive Clinical Staff: In communities without an IL component or where no regular fitness staff are present, therapy and nursing staff can play a more central role in supporting the day to day physical activity needs of residents. This can be key in residents maintaining the positive outcomes they gain as part of a spell in direct therapy services. The passionate, caring, and dedicated staff in your senior living community might be your best untapped or underutilized resource in further serving the health and fitness needs of residents regardless of where they live. The great thing about these individuals I highlighted above is they likely already know many if not all of your residents, where individuals have struggled or what motivates them. If you'd like more assistance in building robust exercise services for residents in assisted living and/or memory care environments, connect with us to find out how we can help.